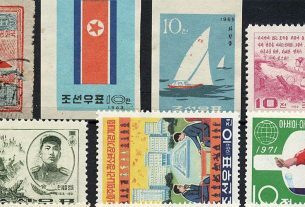 Home > Philatelic History > North Korea > 1959 “Peaceful Reunification of Korea” stamps: real, fake, or a reprint? September 11, 2018 January 27, 2019 Yong Yi4556 Comments on 1959 “Peaceful Reunification of Korea” stamps: real, fake, or a reprint? 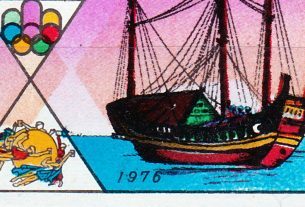 A question from one of our KSS members: are these stamps real, fake, or a reprint? 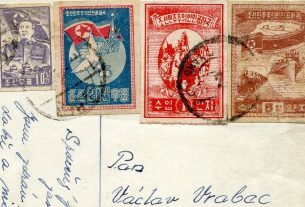 The stamps in this partial sheet were part of a batch of 1961 and earlier North Korean stamps. 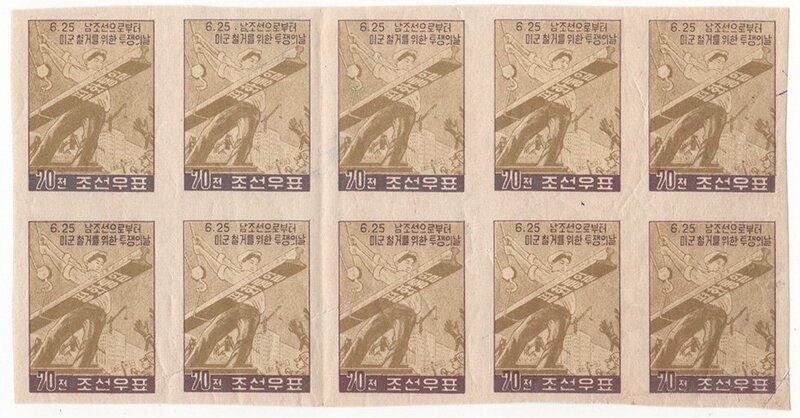 These 10 stamps (2×5) are from a sheet of 70 jeon 1959 “Peaceful Reunification of Korea” stamps (Scott 175a / A141; KSC 151). 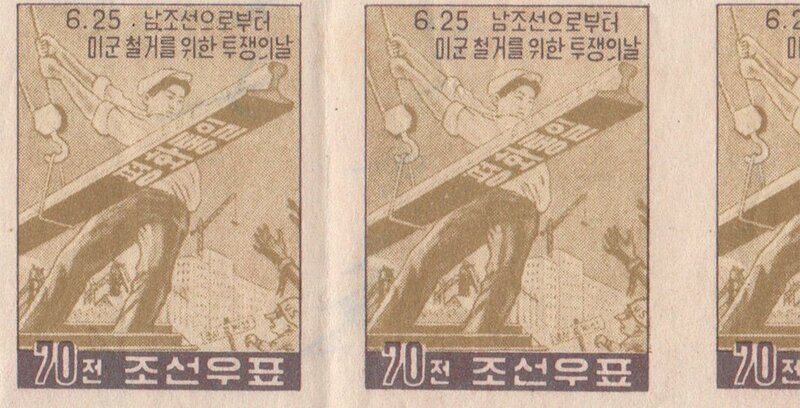 The whole series is listed as “Day of Anti-US Imperialist Struggle”, which also comes with a 10 jeon and 20 jeon stamp. Although the DPRK catalogue mentions no imperf stamps, Scott does. Two of the stamps in more detail. So, dear readers, what do you think: real, fake or a reprint? Please leave your verdict below. 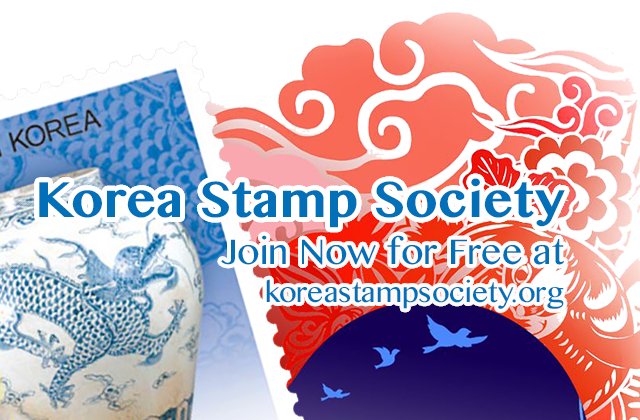 An interesting challenge to KSS members: does anyone have the (imperf) version of the stamp used on cover…? Sorry I don’t really collect covers. Imperf stamps of this period are rare, and large block is even rarer. Scott catalogue price is $175.00 per stamp, which means this block worths USD$1750! I am interested in the images on stamps. So, I am not concerned whether the stamp is a reprint or a fake, as long as the stamp depicted was originally an actual issue. 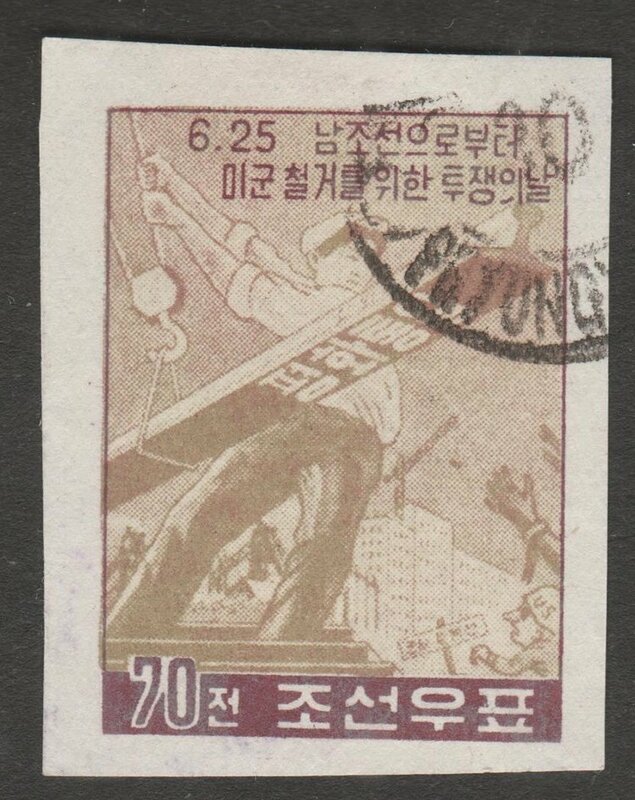 The interesting point about this stamp is that it is one of four which were issued on the 25 June, 1959, nine years after the North Korean invasion of the south. 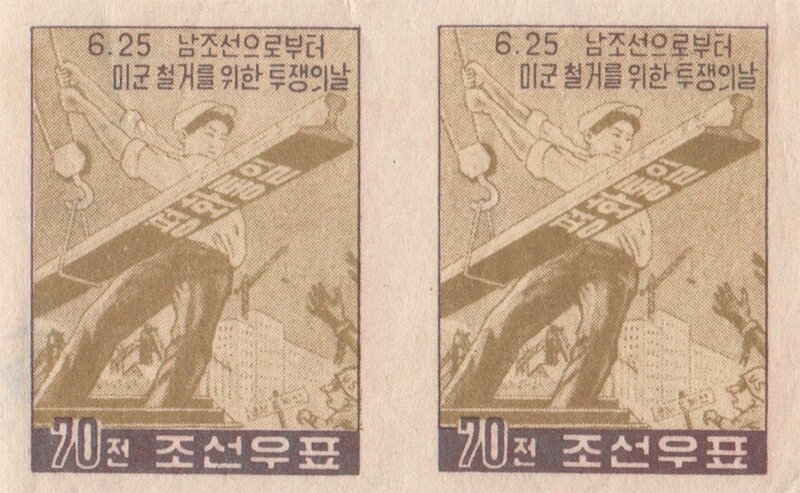 The two lines at the top read ‘Day of struggle for the removal of American troops from southern Korea’ with the numbers 6.25. The term for ‘removal’ is a strong word and can mean ‘demolition’. 6 and 25 refer to the date of the invasion which is seen in the north as the onset of the liberation struggle. The images are dramatic with a classic worker standing on a rail line swinging a rail in place which will, presumably, re-unite north and south. On the under side of the rail is a phrase ‘Peaceful unification’. Two hands which have snapped the shackles holding them reach up (to grab the rail ? as a plea to a northern comrade ? both ?). A worried American soldier looks up anxiously at the heroic worker. A sign in front of him is illegible to me but could be marking the DMZ. In the background are blocks of flats under construction on the right and on the left a mighty industrial plant (steel works ?) is depicted. The heroic worker is helping to bring about unification by putting in place the last link between north and south while the desparate southerners reach out to their northern colleagues, who live in an advanced industrial state. It is interesting to study these images over time and to place them in the context of what policies the NK government was pursuing and the slogans it was using. 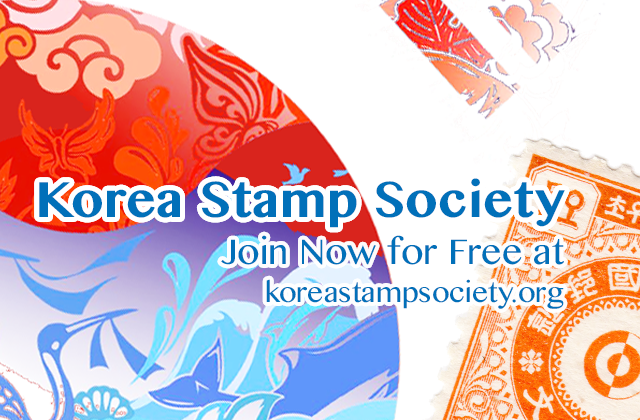 As propaganda, this stamp is an excellent example of NK stamp art.